The Black Swan Arts is hosting a major new exhibition featuring the work of forty-three Arborealists, six guest artists and the renowned painter Paul Nash (1889-1946). Nash is known as one of Britain’s greatest war artists and as being instrumental in the development of modernism in English art. 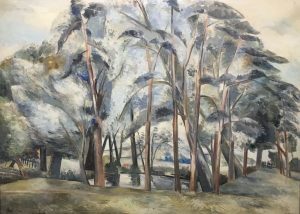 His ‘Pond in the Fields’ which he painted in 1927 as a private commission has reminded in a family collection ever since and has only been shown in public on four previous occasions: at the Leicester Gallery in 1928, Venice in 1938, the National Gallery in 1940, and the Tate Gallery in 1948. Now, 70 years on, the Black Swan Arts in Frome can claim the fifth showing. The exhibition will also include family friendly workshops and a illustrative talk by Julian Hight on some of the world’s most majestic trees. World Tree Story celebrates some of the world’s oldest, largest and most famous trees, including ancient trees of note in the Selwood Forest area, while also telling their human tale and calling for their preservation. The talk is at the Black Swan cafe on 16th August from 7-8pm, you can find out more and book your ticket here. The Arborealists and Guests at Black Swan Arts will be open Monday – Saturday, 10am – 4pm until 2nd September and will take place around the Black Swan Arts, including the Long Gallery and the Round Tower Gallery. For more details visit www.blackswan.org.uk.